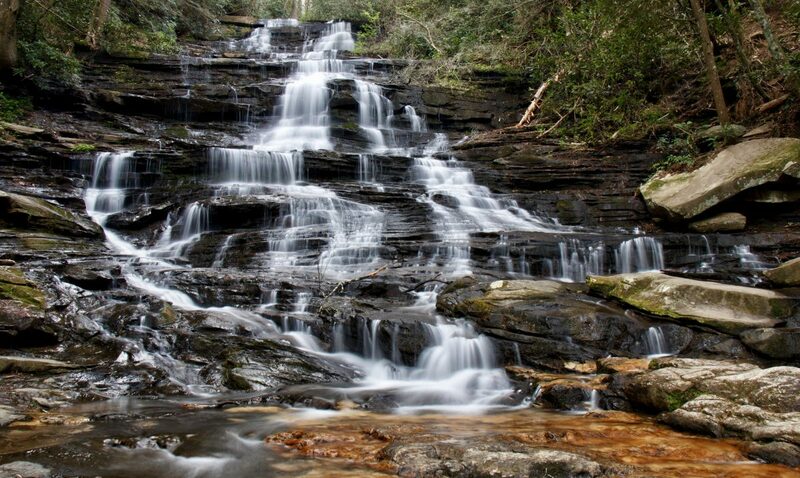 It’s hard to believe that it has been 3 years since I made my first trip to Jones Falls in extreme eastern Tennessee. 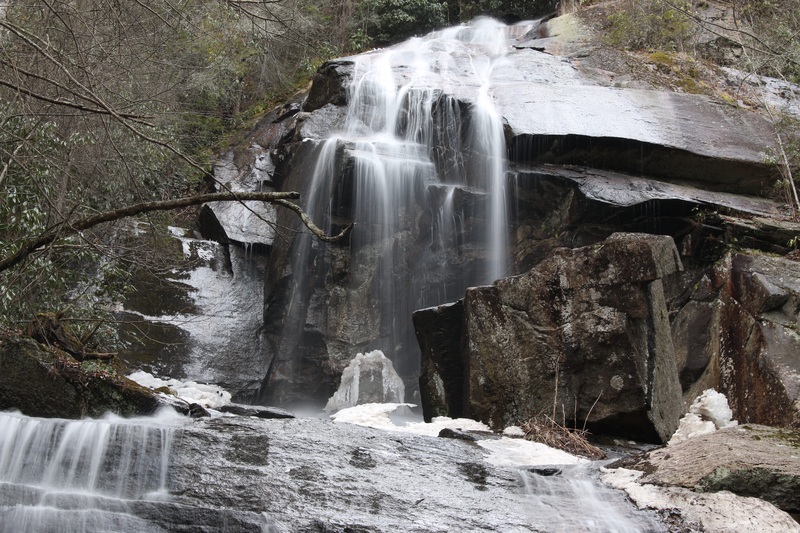 I first visited here in February of 2012 after reading some interesting blogs about other waterfall opportunities that existed right there starting at Elk Falls, in Elk Park, NC. 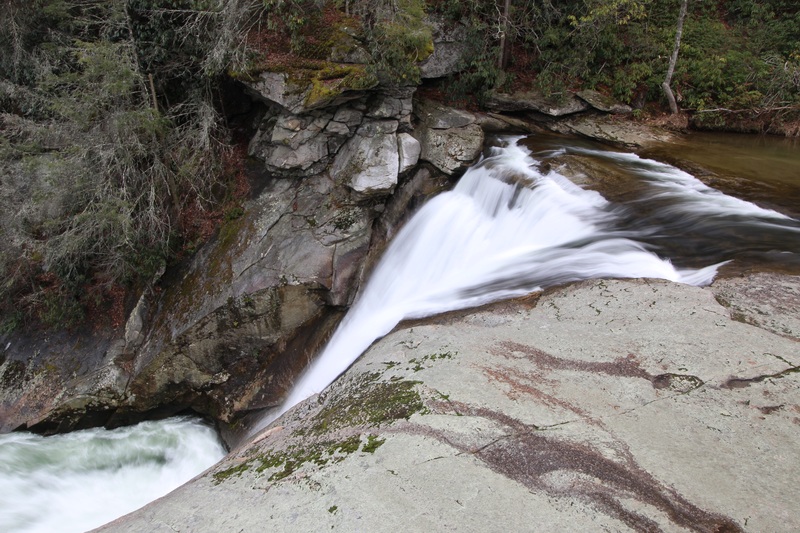 Waterfalls Hiker – Elk Falls To Jones Falls 2012 , gives the details from the first hike. I was not here on this day to redo this hike. I was here for another reason . I had seen some very cool photos from Elk Falls that seemed to have come from a very elevated surface. I wanted to find this spot today and look for some new photo ops. Looking downstream, I did not see anything obvious that would give that elevated view. I decided to to explore downstream a bit and see if things looked different from that perspective. Elk Falls was beautiful today with a healthy water flow and decent lighting conditions. Some recent spring-like warmth has removed most of the ice that covered these waterfalls just a few weeks back. This shot is from the popular rock that juts out about 3/4 of the way accross the river. 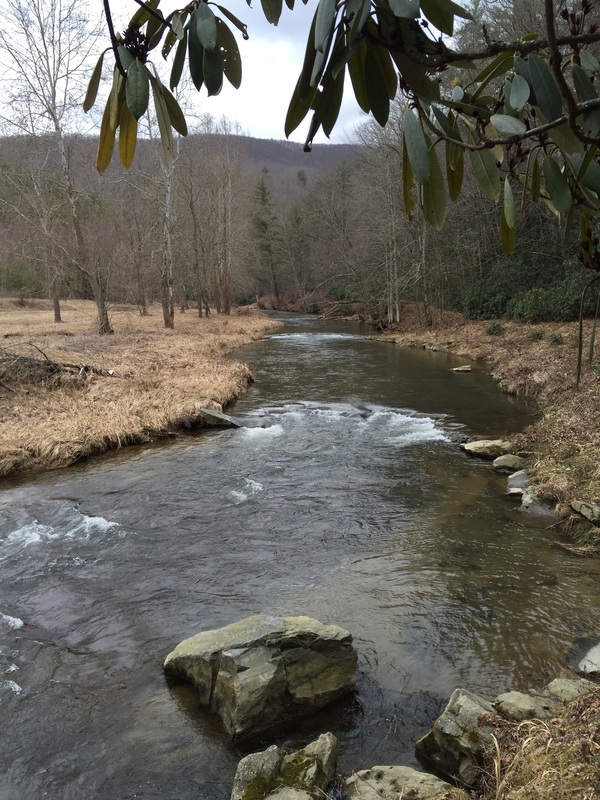 Then….the trail leaves the river, widens, straightens out, only to join up with the road. The photo above shows the trail and road meeting, with the trail going left towards the river marked by the turquoise flag. It appears the forest service, or someone is clearing the old trail, not sure why. There were no exceptional views downstream, only the obvious ones right at the waterfall, which is where I have always thought the trail ended. When this trail ended at the forest road, I was nearly 0.8 of a mile downstream. It was here at this point that seeing Jones Falls became a good idea for today. Intead of walking back up the road to the car, I might as well go on to Jones Falls. I was already halfway there. As far as the elevated views of Elk Falls, I am left to wonder if they were taken by a camera placed in a drone. ﻿ The trail climbing up from the Jones Branch is a short one. It soon reaches an intersection with the Appalachian Trail. 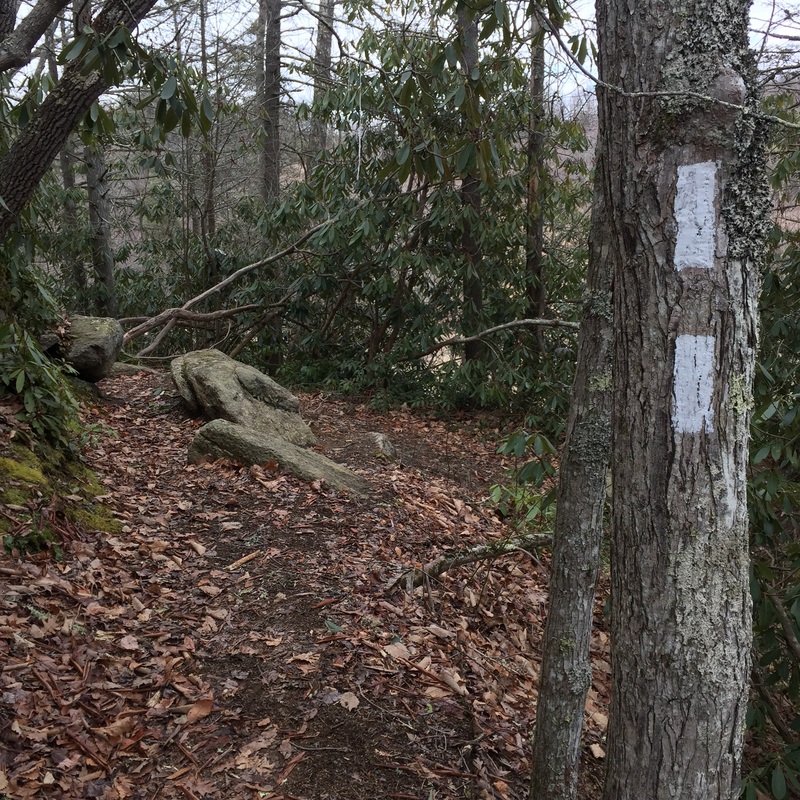 When you see the familiar white rectangular tree markings indicating that you are on the Appalachian Trail, make a left turn. You will be crossing into Tennessee right about now..according to the map. Actually it appears you would be going into Tennessee both directions. The trail will climb moderately through a series of switchbacks. 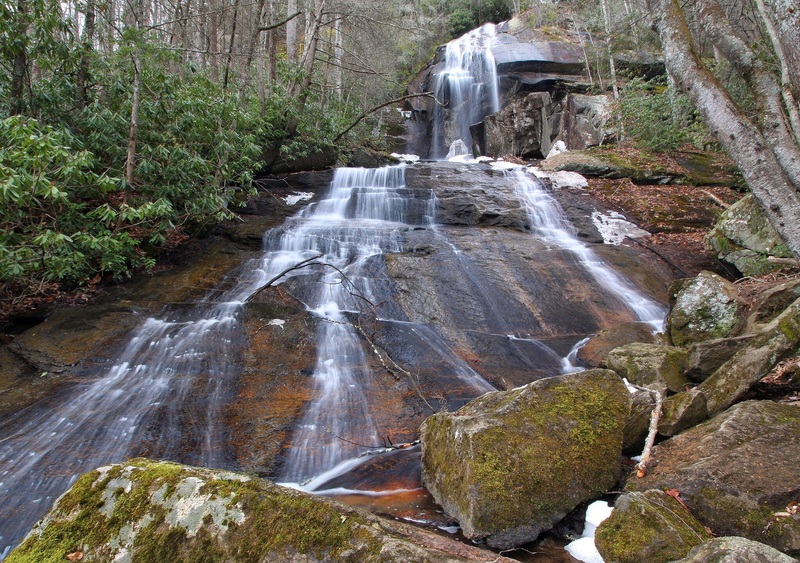 The 100 foot Jones Falls is still halfway up the mountain. Once the climbing levels off, the AT will work around to a junction with a blue blazed trail. The AT heads right here, but Jones Falls is a short ways down the blue blazed trail. There was a nice sign here in 2012 marking this, but it is no longer there. After Jones Falls, just head back the same way for a 4 mile round trip out-n-back hike the begins at a waterfall and ends at a waterfall. There are some videos of these 2 falls at the end.